Q. Congratulations, Rafa. That was a beautifully fought match out there. Just talk about the emotions, you know, for this championship. After the match you threw yourself to the ground. Just talk about those emotions. RAFAEL NADAL: Thank you very much. Yeah, for a few things this season is probably the most emotional one in my career. I felt that I did everything right to have my chance here. So, you know, you play one match against one of the best players of the history like this, Novak, No. 1 in the world, probably on probably his favorite surface, so I have to be almost perfect to win I say the other day here. Means a lot for me have this trophy with me today, no? Is just amazing. Very, very happy, and just thank you very much everybody who helped me to make that possible. Is a really special moment for me. Many thanks to everybody, all the fans and all the team and all the family. Q. What are your thoughts on how you were able to win the third set? RAFAEL NADAL: It was a really important set and was a really special one, yeah. I started so slow the first game, but the end of the second, beginning of the third, Novak was playing just amazing. When Novak plays that level, I am not sure if nobody can stop him. I know that was really important stays only one break behind. If I lose the second break, then is over, the third set. So I tried to be there, keep fighting for every ball, and tried to be focused in every moment and tried to wait for my moment. So I know if I am only one break behind I will have my chance. The normal thing is I will have my chance. Then you can convert or not. I did, but even like this then I had that Love 40 that was really, really amazing. I played an ace. I played an unbelievable forehand down the line, so was one of the key moments of that match. And then for sure that break in the next game. Q. You were away from the game for over six months. How hungry were you to feel this again? RAFAEL NADAL: I was never hungry. I never thought something like this could happen, so excited to be back on tour trying to be competitive. But never thought about competing for all what I competed this year, no? All the Masters 1000s, two Grand Slams, or three. So is just more than a dream for me, and I'm very happy for everything. I feel very lucky about what happened since I came. It's true that I worked, but even like this you need luck to be where I am today. Q. Hungry or not, it's still a good taste? Q. You know, you won this tournament before. Would you say your game has changed and evolved, and how has it evolved and changed since the last time you won this tournament? RAFAEL NADAL: Is always the same. When somebody is winning you need to write, and the people thinks that something change. But the real thing is I am playing well. That's all, no? Because I am playing well, I am able to keep being competitive and keep having chances to win against everybody. Is true that I am playing a little bit more aggressive than before, more inside the court, closer to the baseline, going more for the points. But all this is possible because I am playing well and I am confident, no? Talking about a big change, I don't see it. I really cannot see a big change on my game. Just confident, you know, playing with big passion, fighting for every ball, emotionally good, so that makes that success. The only change that I can tell you is is true that I'm playing more inside and more aggressive and with the right determination. But for the rest, everything is as usual. Q. So 13 slams. Today you had the entire arena of 23,000 rooting for you. Around the world, millions of people love you. What do you think makes you special as a man? Why do you think this is happening? Why do you think so many people are attracted to you? RAFAEL NADAL: I am not the right one to answer that question probably (smiling). The only thing I can say is I try to be fair. I try to be correct with everybody. I try to be friendly with everybody. That's all, no? I think on court I am a positive player. I am not a negative player. I try my best in every moment. Even the things are not going well or are going well, I am not never very sad or, you know, doing a negative attitude on court. Outside of the court I try to sign everybody. I try to make the photos. I act like a normal person (smiling). Q. You feel pride that again and again you advance your game. Is that something that gives you great pride, Rafa? RAFAEL NADAL: At the end is always the same. When you win, you know, that's very important. That makes me happy, this trophy, yes. But what really makes me happy is what I did to have this trophy with me. So that's what really produced me these emotional moments, working hard in tough moments, trying to be positive. A lot of people have been with me during this period of time, and was not easy moments. A lot of days I was able to keep working because of them. When you go to the gym every day and you don't see a positive result, then you lose a little bit your energy. If I have those people around me during this period of time was decisive. Keep working hard, they give me that positive energy. Without them would be impossible have the chance to be here today. And all the fans, too, that really supported me a lot during this period of time was very important for me. Q. With 13 of those major trophies, I think you only trail Pete and Roger now in the all time list. Can you give us a sense for what that means to you? Can you anticipate catching those guys? I mean, you are only 27. RAFAEL NADAL: Let me enjoy today (smiling). For me, is much more than what I ever thought, what I ever dreamed. I said that few slams, when I had few slams less, but is true. Means a lot, this one, for me. Only thing I can say is the same like I do every time. I gonna keep working hard. I gonna keep doing my things to have more chances in the future to be competitive and to give me produce more chances to win the tournaments like this one. So that's what I gonna try. Then you never know when that start, when that finish, but 13 is an amazing number. Q. You have won already Wimbledon, Australian Open, US Open, but everybody until last year had considered you mostly the greatest clay court specialist. For you, you were proud of course to have won eight Roland Garros or whatever. (Laughing.) But it's something different now, because you're proving everyone that you're the greatest or one of the greatest also on hard court? Does it make a difference for you? RAFAEL NADAL: No. No, I know I was a good player on hard before six hours before. That don't make a big difference on my career being better player or worse player. Then is a match. You win, you lose, and then the people who well, I understand most of the people say I am, you know, clay court specialist, but is true because I won a lot of tournaments on clay. And because I won that much on clay seems like other things are less, but I was able to play five finals in Wimbledon, I think. Five? Yeah. I was able to play three finals in the US Open. I was able to play two finals in Australian Open to win. I don't know, three Indian Wells, something like this, three Canadian Open. Q. But you were never unbeaten on hard court like this year. RAFAEL NADAL: Don't worry. I will lose (laughter). Everybody lose. Q. There was a 54 point rally in the second set. What was going through your head during that rally? And were you concerned when you were broken that it might mean something larger? RAFAEL NADAL: Seriously, I felt really tired after that point, but I said, I have the wind on my favor now. I lose that game even I had the wind on my favor. So after this point the opponent will be tired, too, so it's my moment to be strong and I gonna have the chance to break back. That's what I think in that moment. I need to play with the higher concentration and give my best in that first few points of that game and I will have the chance to break back. And I did. I had the break back. Then I have 40 15 in the next game to equal the set 4 All, but Novak played amazing and he break me another time. So that's all. But my thinking was positive. I had the break now, but I will have my chance in the next game. Q. During the match you were down several break points, and I was just wondering what your strategy was, because Novak was making some great shots, and you were too, but what was your strategy to come back from break points and save your serve? RAFAEL NADAL: Is not a strategy to play break points. It's a feeling of that moment. It's a little bit of intuition of that situation, and is play with right determination and choose the right option. Is not a strategy, my opinion. And against Novak you cannot have a big strategy with the serve, because I am not Isner and I will not win that free points. Novak is probably the best returner. He has the best return on tour, one of the best that I ever saw. It's difficult to make the right decision when you have in front a players that is able to return very aggressive, very long. He was able to return winners from every place, so is difficult. I was lucky some moments. That's it. Q. With your problems with your knees before this season, you were talking about how the hard courts affected your knees more than other surfaces, but yet you had the best ever year of your career on hard courts this year after all those problems. I'm just wondering, did something change in your strategy on hard courts or your attitude on hard courts to make that possible? It just seems on paper very surprising. RAFAEL NADAL: I think I answered that just a few questions before. It's a really similar thing. I think nothing in particular changed. I am playing well. That's the most important thing. And I am playing more aggressive than before. But I am able to play more aggressive than before because I am playing well, playing with confidence. If you are not with confidence and you are not playing well, it's very difficult to play aggressive. Mentality was always positive for me. My mentality to play on hard, I never was negative to play on hard. If I had that success, my thinking is not different. Hard court is very aggressive for the body. Q. When you won the third set and you were doing a celebration and the crowd is going crazy, can you try and put into words the emotion of that moment and that adrenaline? RAFAEL NADAL: I really don't know what's going on in that moment. Just was a celebration. Very important point win the third set. After all what happened in that third set, was an amazing victory of that set. I make the celebration, but I really don't have emotions in that moment. Then you finish the celebration. You are walking to the chair and say, Okay, I won the third. I need to be focused for the beginning of the fourth, because I am serving against the wind and the break is possible for him. I need to save that game. Q. What do you remember of watching a year ago the US Open finals on television? Do you remember what you were thinking, what your emotions were? RAFAEL NADAL: I was enjoying the match. It was a great match between two fantastic players. I am a good fan of sport, good fan of tennis, and I enjoyed watching the final in my house in the sofa. And that's all. It was tough not compete, but watch the final on television was not tough. I competed in a lot of Grand Slams, and I watched a lot of finals on the TV (smiling) when I was competing, too. Q. Do you think too much is made of your comeback? Meaning that before you came back, did you really believe that, I'm healthy, I'm still competing for major titles? Q. Did you think before you came back, If I'm healthy, I'm still going to be close to the top of the game competing for major titles? RAFAEL NADAL: The doubt is if I am healthy or not. Then I said, I don't know, to somebody at the beginning. When I came back to Chile for the first tournament I said, Well, most important thing is be healthy. With seven months, I am sure that I will not forget how to play tennis. But at the end, the most important thing and the most difficult thing is be healthy. If you are healthy, if you have been in the top positions for nine years already or eight years and you stop for seven months, why you will not have the chance to be back there? Is normal thing. If you are healthy, if you keep playing with illusion, with exciting and passion for the game, why you will not have the chance to be there? I felt confident that if I am healthy I will keep having chances to compete for the tournaments. Win two Grand Slams in that year is something that I never thought. But if I am healthy to compete well again? Yes. Not that early how I did, because in the third tournament I was able to compete well against very good players, and then win a Masters 1000 in the fourth tournament. So I never thought to have that. But after three or four, five months of competition, I felt confident that I will have the chance to be back playing at the good level. Q. To an observer, this match was really defined a lot by surges of momentum. You were so dominant in the first set, and then in the second set it seemed almost as if Novak took the court away from you of points. And in a way also, you guys have played 37 matches now, which is a record in the Open era. You're kind of entering into new territory as a rivalry. Within that rivalry, even within the rivalry, you have had moments where you had many wins in a row or streaks. I wondered if you could just talk about your sense of the rivalry and going through this experience with Novak and also the changes in momentum. 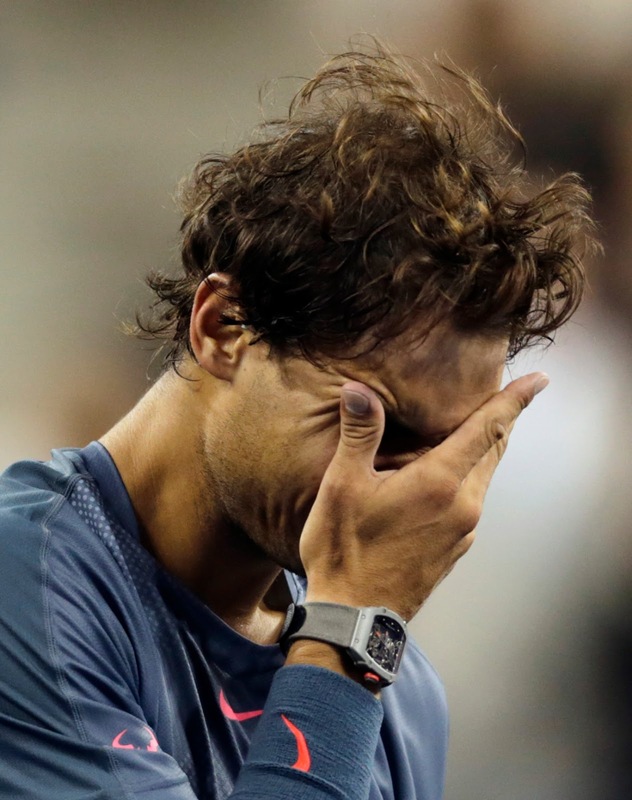 RAFAEL NADAL: Well, I think against Novak it is very difficult. If both of us, we are playing well, it's very difficult that somebody wins the match easy. Because physically, mentally, is very tough to play all the time and at that very, very high level, because we push each other to the limit all the time. When I won this first set 6-2 playing, in my opinion, amazing tennis, was very happy the way that I was playing. I go to the chair and said, Well, now we start again, because I am sure that I am not able to keep playing at that level for two more sets. Is impossible. The opponent will play better. You will have few mistakes, because it's impossible maintain that level for all the match. And when somebody do a little bit like this, then the other one plays better because the level is very similar, in my opinion. We don't play that different style. It's a little bit different when we play against Roger. He has a different style. We are here (Showing arms widespread); with Novak, we are here (Showing arms close together). Talking about the styles. So that makes the matches more, you know, probably tougher physically, and at the same time, all the points are more similar. When we play against Roger, for example, you have different kind of points. You don't have that long, long rallies like I have with Novak. So if somebody is playing very well, the chance against Federer to somebody win easier is higher than against Novak, because there is one clear way to win the points. Between Novak and me, every point is fighting, every point is long rally, every point is more strategy. This is very tough. So all the matches are very special, very tough. But at the same time, that makes special this game that matches are like this (showing same level), and the player who is able to maintain a little bit more the concentration, who is able to play with a little bit more determination in the important moments, will be the player that will win. Today I had that feeling. 2011 he beat me, I don't know, seven, eight times in a row. So depends on the momentum and depends on which player is playing better and is more stable emotionally in that moment. Q. When do you leave for Madrid? After such a long month, how do you feel about playing in a different surface in just three days? RAFAEL NADAL: I will try. I don't know. I will try my best to arrive I will arrive Wednesday morning, so I will practice a little bit Wednesday afternoon. Let's see how my body feels. I have Thursday to practice a little bit more. And if I feel okay and the captain considers that I am the right one to play on Friday, I will. If not, I will play on Saturday. Q. Novak's coach said that the biggest challenge for tennis sport is beating Rafael Nadal in Paris. I think we have to modify the statement. Beating Rafael on any surface can be the biggest challenge in the tennis history, the tennis sport. What is the challenge for you next year? Probably making calendar Grand Slam can be a challenge for Rafael Nadal? RAFAEL NADAL: No. My challenge is finish the season well, try to keep playing with good feeling, try to being competitive until the end of the season, and then prepare myself well for the next season. This season has been amazing, so just try to keep working well and have opportunities to be competitive. Win all four Grand Slams in one year I think today is impossible for anyone. That's my feeling. We will see, but today the best players are there all the time, so to win a tournament like this you have to win against Roger, against David, against Andy, against Novak. These players are not losing in the early rounds, so that makes impossible be 100 percent in every tournament. So when your level is a little bit lower, you will lose against these players 100%. And that's it. My goal is keep having chances to play, to enjoy, and to be healthy. That's the most important thing. Q. You had said after the semifinal when asked if you would look forward to playing, you know, the final against Novak, you said no. You were quite honest, and you said you'd rather have an easier path to win the championship. Q. Listening to you now and hearing you describe how you match up, and he pushes you to have special, tough matches, in hindsight, looking back with the trophy and having won, is it a little more special now having won that having played Novak? RAFAEL NADAL: At the end, the most important thing is have the trophy (laughing.) That's the real thing. Because at the end, when you finish your career, will be the memory that you have. But the momentum, is true that winning against big opponents makes the victory more special. So that's the real thing. If you ask me now, I will say yes. Is more special win against a big player like Novak than another one. But if you ask me what I want when I am in the final, I don't want Novak in front. That's the real thing. I am not like this stupid guy that you want to beat against the best. I don't want to play against the best (smiling). I want to play against an easy opponent. Q. Roger said earlier in the tournament that his love for this sport is more important when things are going badly than when they're going well, when he's winning everything. I was just wondering if you feel the same. RAFAEL NADAL: Is no doubt that Roger loves the sport and Novak loves the sport, Andy loves the sport, me, for sure. We love the sport. Because if you don't feel the sport, is impossible to be regular, to be there all the time for so many years fighting and keep fighting and keep working hard, keep having chances to win. If you don't have these special feeling and this passion, this love for the game, that's impossible. Top players today all have this big passion for the sport. That's why they are able to be in the top all the time and fighting for the tournament until the last rounds. Q. Two questions: One, I think he broke you three times in a row. Do you remember that ever happening? Second question: A lot of amazing points out there, but also Novak had 50 plus unforced errors. Were you surprised by that? RAFAEL NADAL: No, I don't think well, first thing is normal that Novak break me a lot of times because he's the best. He has the best return on tour. I don't go on court thinking that I will have only one break against him. I know if I want to have chances to win the match I need to break him more than two or three times. And then in the fourth probably he make more unforced errors. Sorry, but before that, the unforced errors, in my opinion, we have to analyze the unforced errors, because is not the same when you are making unforced error after 20 shots and running to every place than when you are making an unforced error at the first or second shot. My feeling is Novak didn't make a lot of unforced errors in the early shots before the fourth. Q. Just 12 months ago, were there ever any moments that you thought that maybe you would not be able to play this sport again? RAFAEL NADAL: To play this sport? Q. When you were injured, were there ever any moments when you were concerned that your body would maybe not allow you to play tennis again? RAFAEL NADAL: I am a positive guy, so I never thought about that. Q. You said you watched the match last year on TV. You were a great sport. After the match you texted Andy congratulating him. Have you had a chance to check your texts yet? RAFAEL NADAL: I didn't read yet. Sorry. Q. $3.6 million is a lot of money for working three tennis tournaments. What are your thoughts about that prize money? Are you going to give some to your Indian school, and is that school going well in India? RAFAEL NADAL: Well, we have more projects than that Indian school. We have more projects in Spain, and the foundation is getting bigger and bigger. So I am doing things very often for my foundation, and at the end of the season I will play a few things for my foundation, too. The prize money is great for the sport. The sport is bigger and bigger. Is a lot of money, is true. The only thing that we can say is thanks to the US Open, US Open Series, for that improvement on our sport. They are making a big effort on increase the prize money for the players. Just say thanks. At the end, it's a lot of money anyway. But that's not the real prize money. You have to pay the tax, and in Spain today it is 56, I think. Anyways, a lot of money, yeah. Is more than half. Is more than half less, and then is Euros (laughter). Q. How many chances do you give to yourself to become also an indoor specialist and winning the Masters Cup? Why you haven't won it yet? RAFAEL NADAL: Yeah, is something that is I feel that I am very unlucky, that all the Masters Cup that I played was in indoor hard. Is a tougher surface for me to play well. Is not the day to say, but is something that I feel that is not fair. Because at the end, you qualify for the last tournament of the season when the best eight players are playing on outdoor, playing in indoor, hard, outdoor hard, playing on grass, playing on clay, so why the last tournament of the season should be every, every year on indoor hard? Even if I understand that you play in a city that in that moment have to be indoor. Why we cannot play every year in a different surface? Not every year in the same surface that gives probably equal opportunities to all the players who gets qualified in all surfaces.